Scientists are fighting to save the Florida Reef Tract, the contiguous United States' only coral reef—and the third largest reef system in the world. It’s a swampy, sunny early July morning when I leap off Mote Marine Laboratory and Aquarium’s 21-foot Lady Lynne research vessel and splash into the bathwater-warm waters over the Looe Key reef in the Florida Keys. Clarity and wave action are good, and I exhale a deep, last breath before skin-diving down 25 feet. I settle my fins on the sandy bottom and sway gently with the current. I’m alone in an empty pothole in the walls of the living reef, surrounded by radiant schools of fish and the intense, variegated colors of a vast underwater garden. Everywhere I look I see corals in the shapes of lettuces, fennel, antlers and boulders, along with snappers, lobsters, long, silvery barracuda—more fish and crustaceans and coral than I have the ability to name. A reef shark zips by, sleeker than a fighter jet. As I swim through the labyrinthine, living passageways of Looe Key, I know that I may be witnessing the last, vibrant gasps of the great Florida Reef Tract, the contiguous United States’ only coral reef and the third-largest reef system in the world. Nearly 150 miles long, and four miles wide, it runs south from Soldier Key in Biscayne Bay to the Dry Tortugas in the Gulf of Mexico. Though they cover just 1 percent of the ocean’s floor, coral reefs provide habitat for 25 percent of all marine life, acting as giant underwater apartment complexes for all manner of fish. Reef fish provide food for half a billion people; some island nations depend on them for protein. Reefs grow slowly, some by just a fifth of an inch every year. It can take more than 10,000 years for a reef to form. Yet they’re fragile structures that can be damaged by agricultural runoff, overfishing and even compounds in tourists’ sunscreen. And they thrive in such a narrow temperature range that when ocean waters rise by just a few degrees, they expel their algae partners, which produce more oxygen in warm conditions, making them toxic to their coral hosts. Without the algae, corals turn ghostly white in a process called “bleaching.” They begin to starve and are likely to become diseased and eventually die. Warming water’s equally toxic twin—acidification, the result of pH levels dropping as the oceans absorb excess carbon dioxide—also threatens reefs. Emily Hall, Mote’s manager of ocean acidification research, says parts of some coral reefs in the northern Florida Keys are literally dissolving, as the increasingly acid waters nibble away at the calcium carbonate skeletons that make up a coral reef. When corals die, vast stretches of the reefs are left barren and unable to support most life. Scientists warn that corals are the canary in the coal mine for Planet Earth, vital indicators of the rate of global warming and the oceans’ health. If corals disappear, as some predict they will in the next few decades because of rising ocean temperatures, the stage may be set for the collapse of the rest of the biosphere. Scientists who see the evidence of warming seas in bleached-out, dessicated coral reefs watch in dismay as the United States’ current leadership—and Florida’s own governor—stall or even reverse action on climate change. But many coral scientists have moved on from what they consider a moot political debate and are taking emergency action to save corals from total extinction. Staff biologist Christopher Page monitoring coral fragments growing in the raceways at Mote's Tropical Research Lab on Summerland Key. For Mote, that has culminated in the Elizabeth Moore International Center for Coral Reef Research and Restoration, a privately funded $7 million, 19,000-square-foot laboratory and housing complex on Summerland Key, 24 miles east of Key West, which opened in May. The center serves not only as an education and research facility for scientists and students from around the world but also as a Noah’s ark. Endangered corals are banked and raised there in seawater tanks, some to preserve their genomes in case of extinction in the wild and others for eventual transplant—called “outplanting”—onto area reefs. 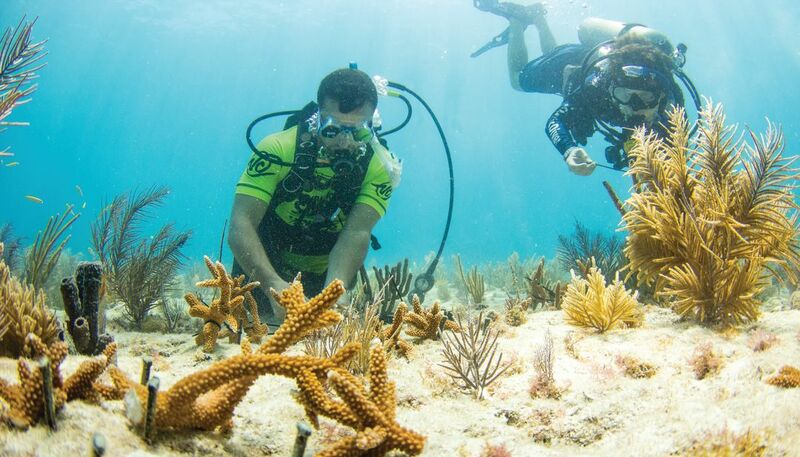 The work is being done under a permit from NOAA’s Florida Keys National Marine Sanctuary, in partnership with organizations such as the Nature Conservancy and Key Largo’s Coral Restoration Foundation, with funding provided by the state, NOAA, the EPA, Mote’s coral reef license plate program and other agencies and programs. At Looe Key, I clamber up the ladder back onto the boat and rejoin my guides for the day, Mote scientists Erich Bartels, 46, and Erinn Muller, 36. Bartels, in his 18th year with Mote and its coral reef monitoring and assessment program manager, looks at me with a knowing grin. “Did you see any elkhorn down there?” he asks. I nod, unable to speak. I’m still spinning from the astounding array of life I just witnessed. We bounce over the turquoise waves back toward the center and a staghorn coral nursery that Bartels manages in the waters off Summerland Key. Beside me on the gunwale, Muller, a specialist in coral health and disease, describes the emotions she and others in the field experience in the face of global die-offs. Minutes later, we arrive at the site of Mote’s underwater staghorn coral nursery, and Bartels, Muller and I dive under the waves. About 25 feet down, a submerged science-fiction forest takes shape in the cloudy water. The nursery is a manmade complex of white PVC pipe “trees” hammered into the ocean floor in intervals a few meters apart; tied to the trees’ pipe branches are bunches of rusty-colored growing staghorn. Small yellow snappers are sheltering among them, just as on a natural reef. The scene looks like a well-tended and wildly fruiting underwater orchard filled with little golden birds. Bartels—who averages 500 dives a year—uses wire cutters to begin snipping thumb-sized pieces of living staghorn from the bunches on the trees. Bartels is “microfragmenting”—a technique pioneered by coral researchers at Mote. In a major breakthrough, scientists at Mote—and now at other coral projects around the world—are using the technique to speed up coral growth, both in nurseries like this one and in onshore tanks. Coral aficionados have long known that if coral is broken into small pieces—as collectors do to trade with one another for their personal aquariums—it will grow up to 25 times more quickly than its glacial pace in the wild. Some years ago, David Vaughan, who is now a Mote senior scientist and executive director of the Summerland campus, stumbled upon that fact. While running an aquaculture hatchery, he moved a piece of elkhorn coral and a small part broke off. Later he noticed that the broken bit, which contained a few coral polyps, had grown quickly and produced more polyps. It was a eureka moment that led him to develop the process of microfragmentation and fusion—growing small pieces of broken coral that will reproduce and fuse together over a substrate, just as living coral fastens itself to a sea rock and starts to multiply. Vaughan, a bushy-bearded 64-year-old who fell in love with coral at the age of 13 on a trip to the Virgin Islands, has used the technique to “reskin” boulder corals in the wild, encouraging live coral to grow over dead coral skeletons. 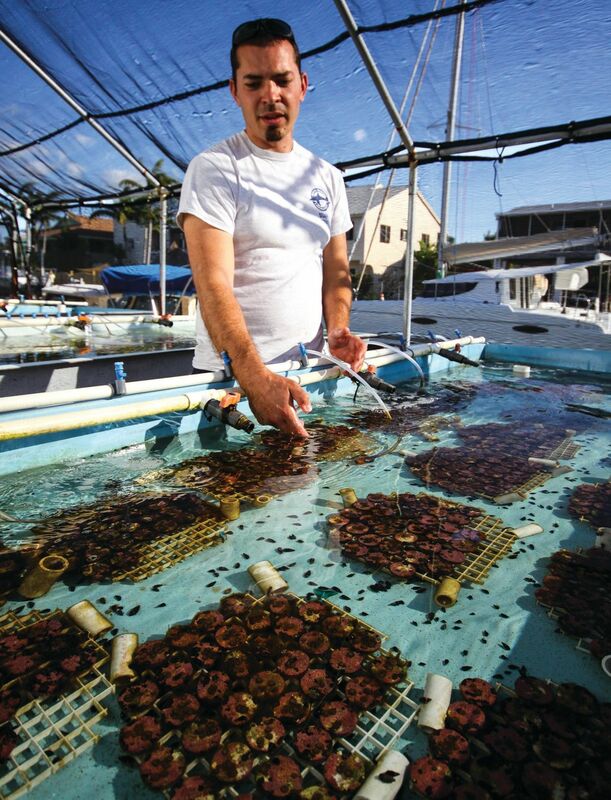 In the past few years, Vaughan has overseen the outplanting of more than 20,000 corals. He hopes to see 1 million outplanted within a decade. “I see this technology developing very fast,” he says. 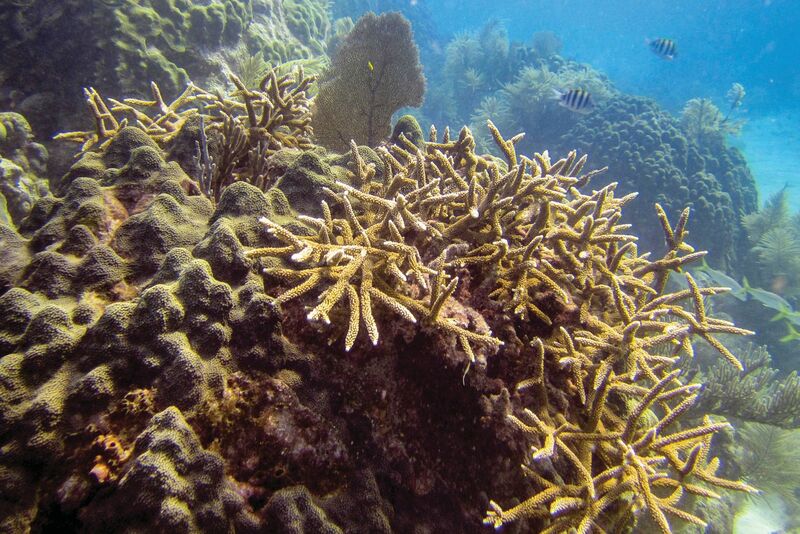 Mote’s outplantings have spawned new coral in the wild, an essential step that leads Vaughan and others to believe that if ocean temperatures can be stabilized, weakened reefs can eventually be restored to their former biodiversity and health. “I hope that in 10 years, coral reef restoration will include many organisms and follow the success of forest, mangrove and wetland restoration in being a common, cost-effective tool that can make a worldwide impact,” he says. 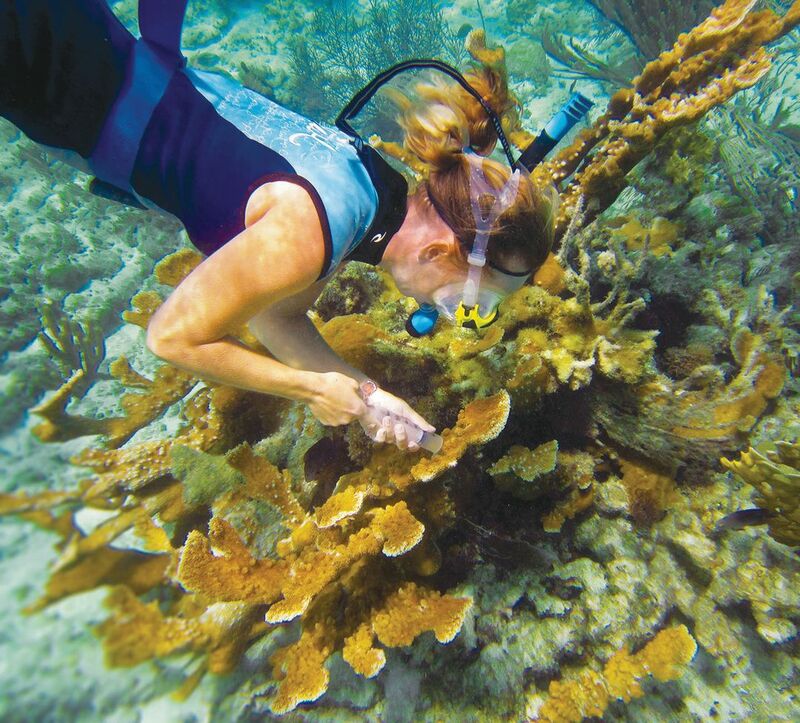 Mote's Erinn Muller conducting coral research. A recent New York Times article about the perilous status of coral reefs recognized the promise of Mote’s new work. “Researchers [at Mote] in Florida may be closest to answering that question [of how to restore something that grows so slowly],” the article reported. It noted that Vaughan can produce 600 corals in an afternoon while it used to take six years to grow that many. But scientists warn that absent political will to wean the world off fossil fuels, oceans are set to grow warmer. Today, Bartels is collecting staghorn fragments for an experiment in ocean warming and acidification that Muller has secured a grant to conduct. By isolating different staghorn genotypes in an array of water temperatures and pH balances, Muller hopes to find “super corals” that can withstand higher ocean temperatures. After more than an hour underwater, the scientists bring loads of staghorn clippings—800 in all—onto the boat and stow them in blue coolers filled with seawater. I handle a piece as Bartels takes us back to Summerland. It’s a rust-colored fragment the length of my forefinger. Heavy for its size, it feels more like chalk or stone than anything alive. It’s covered with tiny dimples like minute porcelain teacups. Within each of these dozens of teacups lives the individual coral animal, Muller tells me, a polyp that extends itself at night to feed on nutrients in the water. In the covered, open-air research area beside the main building, Muller and a small army of high-school-aged volunteers—participants from Key West and St. Thomas in one of Mote’s summer camps—begin to carefully glue the staghorn fragments upright in 40 individual tanks. It’s tedious, repetitive work, and Muller is soon sweating in the midday heat as she directs the students and makes field notes. Alone that night in one of the center’s dorm beds, the paint so fresh on the walls I can smell it, I find myself wracked with thoughts about our vanishing coral, the way of life that has brought us to this point, my own carbon footprint, even the gas I burned driving down from Sarasota to cover this story. It’s a bottomless dread saddled with regret, and I know these coral scientists have experienced these feelings many times over. But I also know that agonizing about it doesn’t do any good. I decide to get out of bed. It’s dark and quiet on Summerland Key, and I make my way with my flashlight down the stairs and outside to the lab that contains the staghorn fragments. I shine my light on their tanks—and there they are, the translucent polyps extended now, and waving in the water anemone-like, just as Muller said they would be! They’re unmistakably alive, delicate and beautiful, clearly made of the same fleshy stuff that I am. I wouldn’t want to live in a world without them. Among their many functions, coral reefs also provide natural protection from storms. An offshore reef can reduce the force of battering waves and height of storm surge. That's exactly what happened when Hurricane Irma hit Summerland Key. 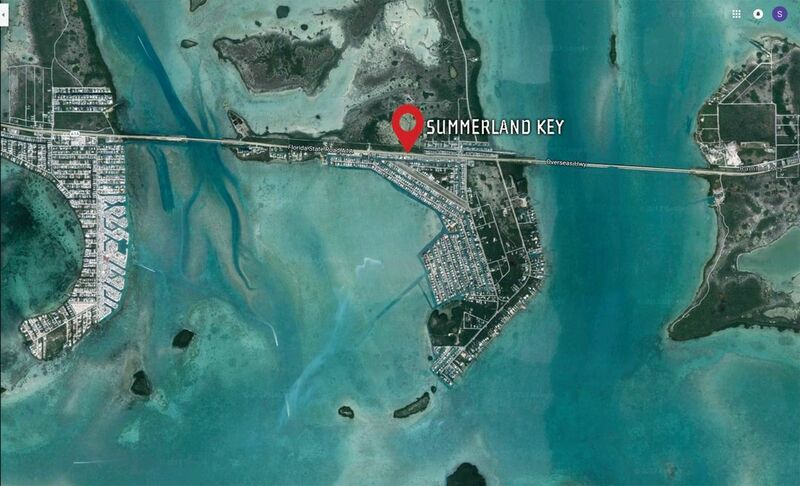 Two months after my visit, just after 9 a.m. on Sunday, Sept. 10, Hurricane Irma made landfall on Cudjoe Key, one bridge west of Summerland Key, with the category 4 eyewall passing directly over the center. In the days before the storm, Muller arranged for the 800 staghorn coral fragments to be driven to Mote’s main campus in Sarasota in an attempt to save her experiment. At press time, Mote could not offer updates on any damage to Looe Key reef or its staghorn coral nursery. But officials say the building, which was designed to withstand a Category 5 storm, weathered Hurricane Irma with minimal damage, maintained generator power, and protected the endangered corals inside its indoor laboratories. Storm surge and high winds, however, damaged the outdoor research area. Mote has established relief funds for employees affected by the storm and for repairs to the outdoor infrastructure, which it plans to restore in the coming months. Sea and air temperatures broke records in the weeks before Irma, making August 2017 the second-hottest month in 137 years of modern record-keeping. (August 2016 was slightly hotter, probably because of El Nino activity, which increases sea temperatures.) Category 4 Harvey preceded Irma by a few weeks; one week after Irma, Category 5 Maria devastated a series of Caribbean islands. Climate models predict more intense hurricanes—bigger, stronger, and producing even more torrential rain—because storms draw their energy from warm water. Like dying corals, they’re indicators of a world on fire. Sarasota’s Tony D’Souza, recipient of special recognition for environmental writing from the California Newspaper Publishers Association, won a 2017 first-place Sunshine State Award from the South Florida Society of Professional Journalists for Best Profile for his “Sunshine and Darkness” in our March issue. Come meet our fish, and our scientists! 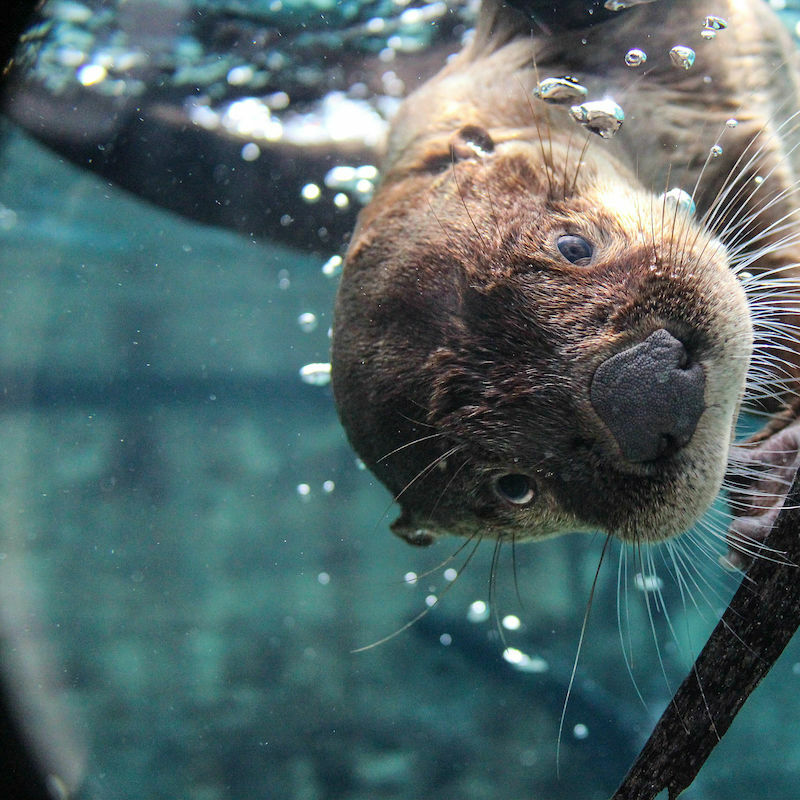 Our working aquarium gives you an up-close experience with a variety of marine animals and fish, including two touch tanks and a 135,000 gallon shark habitat.